I look back to when I posted my first review and think about how much more books are a part of my life now. Up until last year I had never been to a single book signing! Last year my sister and I decided on a whim to go to the RT Convention in Las Vegas. We had a blast! I met some authors that I liked, some I’d heard of and some I’d never heard of but got a free book and decided what the hell, this looks pretty good so I’ll try it! I came away with over 100 books and did not make much of a dent in that pile this year. However, I did come away with some great memories of answering YA trivia questions with Kiera Cass, asking questions to Christine Feehan, and having mimosas with Robyn Carr and Susan Mallery. I’ll admit to a little fan girl stalking of Kristen Ashley and got to re-learn how competitive my sister is playing Candy & Spoons (You are on my radar, Suz, and will be beat this year). Did my interactions with these authors and others influence my feelings about their books? Looking back on a few I can honestly say… maybe? Even as much as I love Kristen Ashley, and as cool as she was in person, not every one of her books equals her others and I think I’m pretty fair but because I’m such a big fan I might’ve scored her last couple a half point higher than I should’ve. I would have to go back and read them to be sure. 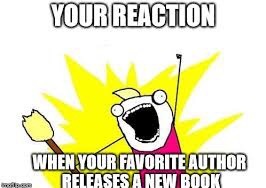 I will say that for the authors I met and enjoyed talking to I definitely read their books before authors I’d never heard of before. I think that’s the point for authors, and that connection with them goes a long way towards helping them make a living. Does it influence my review? No. However, it does get their book to the top of my pile. Recently I’ve gone to a couple of book signings and listened to authors speak about their lives, influences, etc. I really enjoy getting to hear them speak personally and yes, I did buy their books and have them sign them. Did I like those books more? I can’t say because I haven’t read them yet. How much does meeting an author at a book signing or convention influence how much you like their book? Great question! I’ve never been to a book signing though so I can’t really tell, haha! The convention was different than a traditional book signing I think. You pay a lot of many to immerse yourself in books and authors for 5 days, and often there can be 10 to 40 in a room signing. Then at the book fair there’s a couple hundred. It’s overwhelming! Meeting one author at her own signing is more personal. Whether it affects your review? I waffle on that one, truly! I went to a book signing of one and because I’m the rogue High Priestess, I insisted that he sleep with me. After making love, his poems do seem sweeter, better, because now every time I read one I think of him fondly, and we’re writing a blog together. I think when we finish putting it in book form, I’ll have him sign it with a kiss. Sure I’d give him a good review… um, oh yeah, I mean for the book. I hope he doesn’t sign anyone else’s book. I have been to a couple of book signings and I think it made a difference in my feelings about the book. Also, I think I was more likely to recommend the book to someone else after meeting the author. Especially if they had a great personality, right? I don’t know if you’ve read CJ Redwine or even know who she is, but I went to a book signing and she was hysterically funny. She could’ve done stand up. I liked her book, but definitely liked it better after listening to her talk and making me laugh. An effective tool for authors, definitely! I agree. I don’t know CJ Redwine, but I’ll look her up. The authors I was thinking off were the Beekman Boys. I meet them for their cookbook signing and talk, ended up buying one of their memoirs and then recommending it to my father.